I went searching for big bugs and big trout tonight. After an hour in the truck and another 45 minute boat ride I had reached my destination. I was early so I kicked back, opened a beer, and took my time stringing up the rods. As darkness approached the bugs began to appear, along with a massive hoard of alaskan sized musquettos. By 10pm I was listening and casting for hungy trout. It took me awhile to get accustomed to nocturnal fishing, but the moon was bright and the air was warm. By 11:30 the bugs were about gone and I was still fishless. With the help of the moon I saw a very delicate rise near the grass covered bank. A few casts later I was battling an angry beast of a brown trout. With much luck I subdued the giant safely into my net. 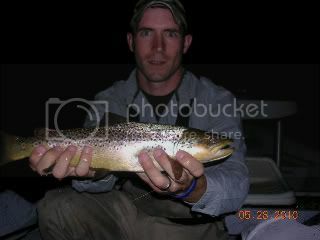 An 18 inch healthy brown made my night a success. That's a solid fish. Fly casting in the dark sounds like a perfect way for me to put a streamer in my ear. But I'll give it shot this weekend.